Roman tanna of the second century; born in Judea; probably a pupil of R. Ishmael, and certainly a contemporary and friend of his pupils R. Josiah and R. Jonathan. 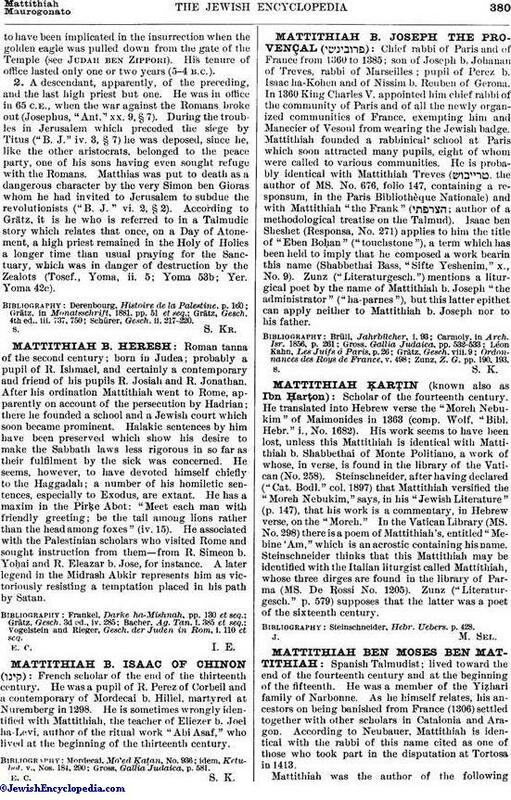 After his ordination Mattithiah went to Rome, apparently on account of the persecution by Hadrian; there he founded a school and a Jewish court which soon became prominent. Halakic sentences by him have been preserved which show his desire to make the Sabbath laws less rigorous in so far as their fulfilment by the sick was concerned. He seems, however, to have devoted himself chiefly to the Haggadah; a number of his homiletic sentences, especially to Exodus, are extant. He has a maxim in the Pirḳe Abot: "Meet each man with friendly greeting; be the tail among lions rather than the head among foxes" (iv. 15). He associated with the Palestinian scholars who visited Rome and sought instruction from them—from R. Simeon b. Yoḥai and R. Eleazar b. Jose, for instance. A later legend in the Midrash Abkir represents him as victoriously resisting a temptation placed in his path by Satan. Vogelstein and Rieger, Gesch. der Juden in Rom, i. 110 et seq.